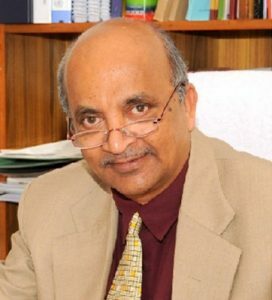 R. Venkata Rao, born on 15th March, 1954, is the Vice-Chancellor of the National Law School of India University Bangalore. He has assumed the office of the Vice-Chancellor of National Law School of India University Bangalore on 11th May, 2009. After the completion of his first term on 10th May 2014, his appointment as Vice-Chancellor has been renewed for another five years from 11th May, 2014. National Law School of India University, Bangalore is the premier centre of Legal Education. Prof. Rao’s academic qualifications are B.A., (Hons. ), Litt., M.A. (Litt. ), ML, Ph.D. He has served for 31 years in the Faculty of Law, Andhra University in various capacities as the Dean, Faculty of Law, Principal, University College of Law, Chairman, Board of Studies in Law and Head of the Department of Law. He was the Director of Centre of Criminal Justice, Andhra University from 1997-2009. He served as the Dean of Student’s Affairs, Andhra University and as the Officer on Special Duty, Andhra University. He also served as the Member of Executive Council of Andhra University from 2005 to 2007. 4. Member Academic Council and General Council of NALSAR, Hyderabad. He has the distinction of receiving the Best Teacher Award from the Government of Andhra Pradesh in 2006, the Best Researcher Award from the Andhra University in 2003 and Gold Medal for the Best Ph.D. Thesis. He has been awarded the “Best Vice Chancellor Award for Outstanding Contribution to Education” during the World Chancellors and Vice-Chancellors’ Congress, 2014 held on 27th June, 2014 at Mumbai. He has been associated with several prestigious bodies like Union Public Service Commission (UPSC), New Delhi, University Grants Commission (UGC), New Delhi, National Assessment and Accreditation Council, Bangalore, several Ministries in the Government of India, several Universities in India and Abroad as Expert in various Committees. His primary area of research is Human Rights, Humanitarian Law and Criminal Justice. He has guided successfully 16 Ph.Ds. and more than 75 M. Phil scholars. He has participated in a number of International and National Conferences and delivered a number of Key-note Addresses. To date he has published more than 120 papers in journal of National and International repute apart from presenting several papers in National and International Seminars. He has visited Almati (Kazakhstan), Geneva, Germany, Thailand and United States of America, Italy, Malaysia, Argentina, Nepal, Japan, Dubai, Mexico, Bhutan, China, Sweden, Kish Island, Russia, Singapore, Shanghai, Munich, Seoul, Istanbul, Dhaka and Colombo, Cape Town and Paris, among others. He served as Chairman, Board of Governors, Asian Law Institute (ASLI) for the year 2010-2011. He is an Independent Director in prestigious Public Sector Undertakings like: Hindustan Aeronautics Ltd (HAL), Bangalore, Bharat Electronics Ltd (BEL), Bangalore and Goa Shipyard Ltd, Goa and Member, Board of Governors, Indian Institute of Corporate Affairs (IICA), New Delhi. He is also a member of Legal Education Committee and the Equivalence Committee of the Bar Council of India. He was a member of the Task Force Committee constituted by Government of India for suggesting reforms in the Modernisation and Self-reliance of Defence Sector. Late Sri I.G. Hiregowdar, Advocate, Endowment Lecture on “The Importance of Ethids in Legal Profession” at the University College of Law, Dharwad, Karnatak University on 28th February 2011. Bodh Raj Sawhny Memorial Lecture on “The Role of Judges in Delivering Equitable and Speedy Justice” in the year 2011. Arasanahalli M. Muniswamaiah Memorial Lecture at Acharya Nagarjuna University on “Dr. B.R. Ambedkar and Making of the Constitution of India” in the year 2012 at Guntur. Delivered G.R. Gandhi Memorial Endowment Lecture on “Judicial Appointments: Concerns and Caveats” in 2015 at the University of Pune.